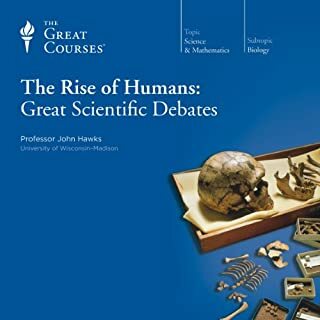 This course is a great survey of the path of human evolution, the history of the human race. It is thoroughly enjoyable as a listen but it doesn't delve very deep into the topics discussed. So, A+ for anyone dipping their toes into this subject matter, or for anyone who wants their interest piqued so that they can stimulate questions on what direction to go to for your next book on the subject. For people well versed in this subject, this is still a nice listen but won't challenge you much or broaden any horizons you likely haven't touched yet. But, as much as I do, this book is really really really geared towards women. I should have seen that coming and I'm completely ok with that. I'm glad I read it but I found out rather quickly, I was not the intended audience. 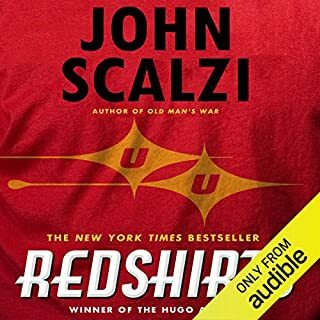 Scalzi serves up another witty and fun story with lovable characters and excellent narration from the "always on point" Mr. Wil Wheaton. There's a lot to like here, especially for the obvious Star Trek TOS fan. I wish I didn't have to say it, but I don't know if this book works outside of a working knowledge of the original Star Trek series. In any event, it makes the book more enjoyable. Like an inside joke. There is a surprise touching ending to coda 3. It's romantic and sad, and also hopeful. I would never have expected it but it came to me as a little gift at the end of an story that is otherwise mostly levity. Kurt Vonnegut's absurdist classic introduces us to Billy Pilgrim, a man who becomes 'unstuck in time' after he is abducted by aliens from the planet Tralfamadore. In a plot-scrambling display of virtuosity, we follow Pilgrim simultaneously through all phases of his life, concentrating on his (and Vonnegut's) shattering experience as an American prisoner of war who witnesses the firebombing of Dresden. 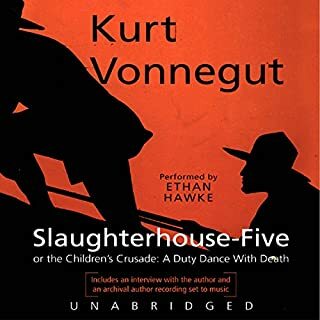 I had no expectations coming into reading Slaughterhouse Five, and as such, I wasn't immediately hooked into the storyline but rather settled into it over the first few chapters. 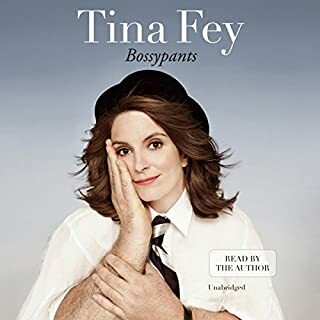 I was turned on to this book after seeing it appear in so many "best of" lists. It also helped that professor Drout recommended it in his Modern Scholar survey of science fiction literature. I don't wholeheartedly believe this is science fiction at all. Seems to me like historical fiction about the after effects of war. Possibly about dealing with PTSD. Looking at it that way, you can see why the novel remains relevant to our time. That's not to say that the novel is only relevant because of our ongoing national commitment to war. So it goes. Vonnegut manages to construct his prose in a manner reminiscent of Hemingway, but approaches the structure of the story in a thoroughly modern way which is, at times, disjointed and appropriate to the mental state of the main character. All that being said, readers should be cautious in taking Slaughterhouse Five at face value. It is a memoir of a broken man. It would be easy to blindly accept Vonnegut's notion that since war is ultimately meaningless, all things are meaningless, meaningless things were always meant to happen, they were designed to happen, we have no free will to do anything to stop it, our only choice is to allow things to happen to us, we have no free will at all. In my opinion, that is dangerous thinking that will lead many astray. It is important to recognize that one may very well feel like that is the way of the world when subjected to the kinds of atrocities mentioned in the book, however, if you remove free will from the equation, then the Nazis who brutally murdered innocents were as responsible for their actions as a child who dies in a fire bombing is for his own death. The author makes the case that a Nazi's job is to kill, a victim's job is to die, a bomber must bomb, and children must die. It's just the way things were designed to be. Historically speaking, it is important to document that war has the effect of sapping hope in this way... But the pitfall is to accept this as truth and not as the words of a broken man. I would suggest Victor Frankl's Man's Search for Meaning as a counter study to this novel. There we see despair turned to hope instead of the other way around. Ethan Hawke did a marvelous job in his performance. I was thoroughly convinced that here was a man who had witnessed so much tragedy, that his only recourse was to totally disconnect from all emotions and even to disconnect from his own reality. He delivers the harrowing events of war and the tragedy of life afterwards with a calm sort of complacency that is soothing and disturbing. You get the sense that this is a person who has accepted his fate, relinquished all hope, and decides to take what comes his way with apathy. It is, in fact, all he has left to offer. Perfectly played. 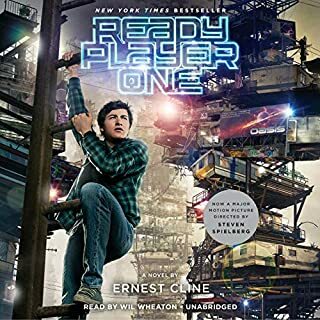 The "setting" for the book takes place in a computer simulation that reminded me of the visuals from the Scott Pilgrim Movie, particularly where things look like the inside of a video game, music notes and light coming from instruments, VS subtitles underneath P2P Fights, Things pixelate into "bonus items" when they get destroyed. Honestly... there's so much that it's hard to remember. Quit reading this and just go download it.